Located on the outskirts of Austin, Jester King is the most exciting brewery in Texas today. "Dedicated to wild ales and spontaneously fermented beers", they have a fascinating deep portfolio of farmhouse style beers that run the gamut from delicate fruit sours to bruising wild-hearted stouts. 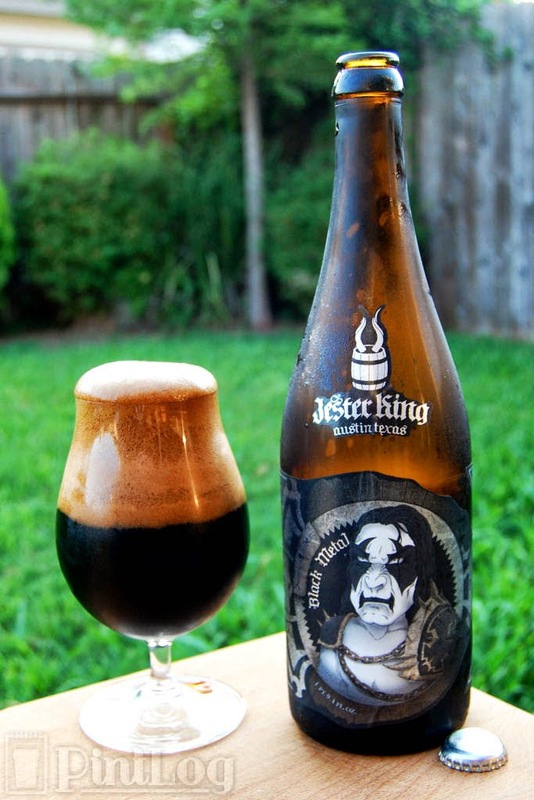 Black Metal was Jester King's first beer to be bottled way back in 2011, before Jester King meant wild yeast brews. An Imperial Stout designed as their Winter seasonal, Black Metal is the beer that put Jester King on the map for many people. Pitch black with huge notes of chocolate, roast, coffee, burnt malt and alcohol balanced by aggressive hop bitterness. After a year or so, this original version was supplanted by a new farmhouse version as Jester King evolved into the farmhouse charmer it is today. Bottles of the original formulation are still sought out today. Let's hop in the time machine and visit the metal of old, shall we? Appearance: A loud hiss as the cap is cracked. Pours a inky pitch black body that lets no light escape. Up top, well over three fingers of fluffy and bubbly tan head featuring brilliant retention and patchy lacing. Aroma: Vinious dark fruit, ripe banana, chalky and roasty dark malt, and a lot of booze (even more as it warms). Taste: Lots of chocolatey, coffee-like, licorice-like, nutty, smokey, and astringent dark malt up front. Vinious dark fruit and citrusy hops showing up a little later to keep everything balanced. Lots of spicy booze throughout. Bitter hops, roasty malt, and spicy booze in the finish. Mouthfeel: Medium-full bodied and creamy with medium-high carbonation and a drying finish. Nice slickness and warmth from the alcohol throughout. Drinkability: Hardly a speedy drinker, but it drinks faster than the double-digit alcohol would suggest (given you aren't shut down by a little burn). Verdict: Black Metal is an enjoyable Imperial Stout and it's great to see more big beers coming from right here in Texas. At the end of the day though, this feels just a little homebrewed (not necessarily a bad thing) and not quite dialed in. Looking forward to seeing how this matures; maybe everything is going to come together in time as it mellows. Compared to the Farmhouse version that supplanted this brew, I have to say I much prefer this recipe; Jester King giveth and Jester King taketh away. Hopefully I can hold on to the case I've squirreled away for a while. Note: While this review is being published in 2014, the tasting notes contained within were taken when the beer was fresh in 2011.